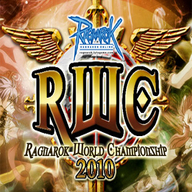 Ragnarok World Championship (RWC) is one of the biggest tournaments in e-sports game Ragnarok Online, where various countries fight over the position no. 1 as the best Guild in the world. For schedule and live report visit http://rwc2010.lytogame.com/livereport/index.php?lang=eng .